My latest post for Kirkus Reviews is now up online. Originally, I'd planned on finishing out the Science Romances with Olaf Stapledon, but when went to see if there was anyone else to look up, I found a notable author that I'd overlooked: Athur Conan Doyle. While he's most famous for his Sherlock Holmes stories, he was a prolithic author. 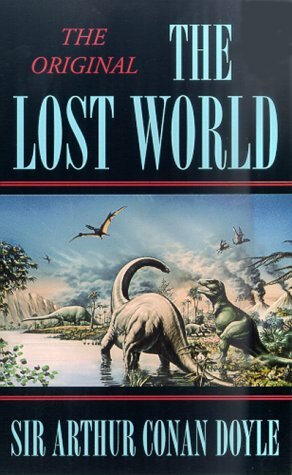 His novel The Lost World captured my imagination as a young teenager, and I was surprised to learn that there was more to that series. Read Exploring Lost Worlds: Arthur Conan Doyle's Professor Challenger over on Kirkus Reviews. Billion Year Spree, by Brian Aldiss: One of my usual suspects for sources, surprisingly, Robert and Disch's history don't have any mention of Conan Doyle's character, which surprised me a little. While he doesn't seem to have had the impact of other authors, his stories DO demonstrate the impact of Jules Verne and Edgar Allan Poe. Arthur Conan Doyle: A Life in Letters, edited by Jon Lellenberg, Daniel Stashower and Charles Foley: This is a stunning biography of Arthur Conan Doyle, one that intertwines an incredible number of letters with commentary from the authors, which provides an incredible insight into Conan Doyle's busy life, his relationships with other authors and family members, and how he set about writing his stories. Highly recommended for anyone interested in ACD's works.